SM58, Dynamic Microphone from Shure in the SM series. sammy mahenia's review"This is the best deal of a mic"
I bought this mic after seeing the review on https://studiogearexperts.com 7 months regrets later, i have no complain about the mic. I also use it in my studio and it meets my demands. if you are a vocal performer get this one! The Shure SM58 was one of my first microphones that I used to record with at home. I have pretty much used all of the Shure Line mics. The thing that’s best about this one is its good for a little bit of everything. No matter what frequencies your voice is, it works. You don’t even have to have a windscreen. I remember recording with this mic, with no stand or windscreen. With a little bit of Eqing, it sounding amazing for just recording in my living room on my Toshiba laptop at the time. I have came a long way from those days. But I would still use the SM58 in a heartbeat. I recommend this mic to anyone starting out. Its really cheap and sounds great. The mic is very precise with the sound, you may have to cut out some of the lower end frequencies with it, depending on how close you are to the mic and how deep your voice is. That was the only issue that I had when using this mic. I didn’t try any models prior to this one, I think I might have use a cheap radio shack mic 1 time but when I got this that thing went in the trash! I am very happy that I found this mic many years ago. Shure really put out a quality product with this and best of all anyone can afford it. It is even being sold in most of your main stores now, you no longer have to go to a guitar center or sam ash to find it. I wont be surprised if wal mart doesn’t carry it, (if they don’t already?). A high quality mic for a great price… I stand by it! Don’t waste your money on all those mics that cost twice as much as this one, this one will work just as good and save you money at the same time! The shure sm58 was one of the first mics that I have ever used, I think I got it a radio shack. That is crazy that a mic this good was sold at radio shack a long time ago. Sonically the response has a nice presence peak in the upper mid range, but the top end rolls off quickly after that. Opinion is split about whether that is a good or a bad thing – it helps keep a lid on feedback, but it doesnt sound as hi-fi as some other mics. I have had some singers complain that their vocal top end is not quite right - sometimes asking for more top end. I guess they are used to the sound of expensive condenser mics on their recordings. My solution is normally to give them another mic, like a Beta 58, or Beta 87a maybe, rather than use EQ. If you A/B test an SM58 verses these mics it will always lose. But it can still be a better mic in some cases, such as when you are looking for a cardioid rather than hyper-cardioid response (the SM58 has a cardioid response, which means it has a wider pickup pattern at the front). But most vocalists will be more than happy with the sound the SM58 gives. The SM58 also does a pretty good job on drums (not really bass drum), and other loud things like guitar cabs. It uses the same capsule as the SM57, one of the best mics for guitar cabs. I've given other microphones in the same price range, (and even some that are pricier) an honest test drive, but I just keep coming back to my SM58. Some of the competitors have a lot more definition and are more sensitive, etc. - but to a fault. I can get right up on this mic and sing as loud as I can and it doesn't get harsh like my other mics do. So, until I find something I like better (and I doubt I will), I will keep on using my SM58. The 58 is sort of like the 57 with a different front as most people have argued. They both seem to have the same type of sound, that is with enhanced presence and upper midrange and not much low end. These are good for vocals and increases the presence through the mix for most people. I've used the 58 like a 57 for experiments and have found that it doesn't quite suit the job as a 57 would and is definitely geared more for straight forward vocals. Compared to the 57 there are slight differences, the 57 actually seems to have a bit more low end overall while the 58 is a bit cleaner and clearer in general. The 58 has become the worldwide industry standard microphone that you'll see on every stage from small to stadium-sized. It's a decent sounding mic and relatively well priced. There have been many variations made of this microphone with slight EQ tweaks and what not but in my opinion for a dynamic vocal mic it really doesn't take much in terms of a mic to get some good sounds if you start with the SM58. For live use, I'd say these are the SM58 vocal mics and SM57 mics are the ones to be looking at, for recording purposes they are decent but if you can spend a bit on decent condenser mics you may be better off. I've personally stopped recording with dynamic mics for most situations (minus drums) but for live it's almost absolutely necessary as most stages aren't totally capable of handling condenser mics in a good manner. This mic is the "live vocal" microphone. Go to any bar/venue and check out what people are singing through and chances are it will be a sm58. That being said, it can be applied to many other instruments. Its essentially the same mic as the sm57 but with a pop filter. This is so that you can get up close and yell intro the microphone without creating to many painful pop noises. It also means that this mic can be used on almost any source and sound pretty good. Some engineers claim that you can mic anything with a sm57 so the same is true with a sm58. It has a slightly lower presence peak in the 8-11 kh range due to the pop filter but that is hardly noticeable to the common ear. I really like this mic. It's prefect for live sound on most instruments, especially vocals because of the pop filter. I generally don't use it on most studio recordings. I have access to a bunch of sm57s so I generally use those instead but you could definitely use this on guitar, drums, percussion, or anything really. It's really nice on loud sound sources. It's a bit of a darker mic but I think that adds some interesting character to certain instruments (guitar, snare drum, etc). For the price ($100) you can't really beat this mic (except with maybe an sm57). I would definitely buy another if I lost mine. It's great for live vocals but it will sound good on most things. Well, we all know about the ol Shure SM58! This has probably been everyone’s first mic. This mic is better for live performance than it is for studio recording. Because when recording in the studio with this mic there seemed to be more air than normal transferred in to the mic, even with a screen in front of it. But when I heard the live performance on it, it sounded crystal clear! I remember getting this mic when I was young, and thinking it was the best investment I have ever made. it’s a very good mic but once you put some real money out you will be able to tell the difference. I like the price of the mic the best, it’s a decent mic around 100 dollars and it offers good quality for it. But if you can save up a little more there are mics that go from 200 to 400 that are way better. But in the 100 dollar price range there is nothing better than the ol stable handy Shure SM 58 . 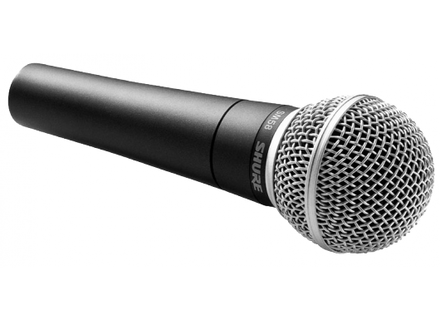 The Shure SM 58 is a standard great starter mic for any body wanting to record vocals. The thing I like the most about the Shure SM58 is the quality for the price, you wont find a mic in this price range that has this quality. Shure makes quality products that they stand by and give you great support. I wouldn’t have chose any other first mic for 100 dollars. This one allowed me to create great music and still learn without spending a small fortune on a “high quality” mic. The sound quality is great and very natural in a live setting. I didn’t have a chance to try any other Shure Mics, but I guarantee they are just as great as the Shure SM58! Anonymous 's review"You can never go wrong. But you can certainly go more right." Ahhh. The legendary Shure SM58. Venerated by anybody to ever take any interest in microphones ever. 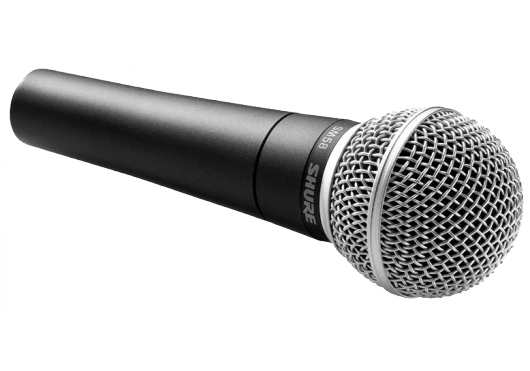 If you have ever sung on stage, it has probably been into a Shure SM58. The reason for this is simple: it just works. The Shure SM58 has a very solid reputation of being able to sound good on almost any source imaginable, take the place of a hockey puck for five minutes, (I'm serious. Look up the video. People have taken slap shots at the Shure SM58 while it was plugged in, and use it afterwards) and still keep chugging for years. No matter how bad it may end up looking, it will continue to sound good for years and years and years to come. This isn't to say that the Shure SM58 is the end all be all of all microphones ever. There have been several much more specialized and technologically advanced microphones that have been invented and relied upon ever since the first Shure SM58's rolled off the production line. The Sennheiser 835's, the EV N/D series, the Heil live microphones. These microphones in my opinion, at least on my voice (high baritone, relatively rich in comparison to most pop and rock singers), are far superior to the midranged focused, honky microphone in the Shure SM58. Shure just got it right that time. If you've never owned a microphone before, there is no reason for anyone to ever pass up the SM58. This is because you will never be short of advice or opinions on how to squeeze every ounce of quality out of it. So for $100 new, you are setting yourself up for a lot of joy in the Shure SM58. I fully and utterly recommend it, no matter what you're doing. You may not always be getting the cream of the crop in every application, but it will never actually fail you. Ever. themaddog's review"The standard for live vocal performace"
This is a dynamic microphone meant primarily for live vocal use. It is the standard for live vocal performance, but they've been making them for very long time without an on/off switch on the vast majority of their models. Run with it, spit on it, drop it, and it'll still keep on working, sounding the same as it ever did (even with a bent grill). This is the standard for vocal performance. Most clubs use this as their house mic, but that doesn't mean it is the very best mic. It is a good standard microphone for most people. For those with a thin sounding voice, using the proximity effect of boosting the bass by putting the mic right to their lips will give a much fuller sound. The SM58 is pretty quiet when handled, which is probably its greatest attribute live. Electrically it is very similar to the Shure SM57, which is the standard for miking guitar cabinets. If you are in a bind, you can use an SM58 for this purpose and probably won't hear the difference between the two microphones. If you can get this microphone used, it's great to have a small arsenal of these if you have a band with multiple vocalists. That being said, there are a lot of phonies out there from the East, so beware when buying one used, especially over the internet. If you purchase a new one, buy it from a reputable, local store if possible. For a starter project studio, this or the SM57 are great first microphones as they are so versatile. They might not be the best recording microphones, but they can be used for so many different purposes. On vacation I've taken an SM58 with me for recording in a Portastudio and achieved some good results. I've never had a Shure product quit on me, which is saying something! Just wanted to review my favorite mic of all time the Shure SM58. Everyone who is anybody has used it through the years. The popular black base with the silver top you can spot the SM58 from a mile away! I was in a band that required me to sing backup vocals. I paid $89 for it brand new. It can with a clip, bag and cool sticker. I knew of their reliability and knew it was the mic for me. I like it because it is a solid piece of gear. It is the industry standard. Sound guys know how to mix them and they work for almost any application you need mic'd. I have used this microphone to mic guitar amps, bass amps, acoustic guitars, acoustic pianos, Hammond Organs as well as kick and snare drums. It may not be the best mic for each thing I just mentioned, but in a pinch it will get the job done. Nothing at all. It's a microphone to perfection. In a perfect world I'd like to see it get maybe a little bit hotter of a signal, but complaints at all. The textbook definition of road worthy. I have some beat, I mean BEAT Shure Mics. I prefer to sing through my own mic since I know what it sounds like and well germs are a big factor, you want to stay healthy on the road. I have thrown it in back packs, dropped it, spilled drinks on it, put it in front of everything imaginable and it still works. Henry Rollins can't even break this mic! If you need a mic, this is it. Best $90 you will ever spend. There are a few cheap knock offs out there. Yes, you can get them for half the price, but they are not as durable or a nice sounding. Get the real thing, get a Shure. This is a Dynamic microphone. It can be used in almost any setting. I don't recommend it for Vocals in a Studio setting because you should really be using a quality condenser for that. But, I was told a few times by a few different people that the SM 58 and the SM 57 are identical microphones with the exception of the Grills. With that being said, I have used my SM58 on all sorts of gear including Guitar amps, bass amps (in conjunction with a Beta 52a), drums (snares and toms) and yes, even vocals (before I got some nice condensors). With the exception of Vocals, this thing sounds great on everything in the studio. There is a reason that Shure SM mics are the industry standard. They are very clean and crisp and they can take a really good beating and keep on trucking. As for live situations, these things are essential for any working band or venue. I used to host an open mic for over a year and the venue had about 6 of these and they were dropped repeatedly buy clumsy or drunk musicians and every single one worked great the whole time I was there. On top of all that, I asked the owner at one point when he got the mics and he said many years ago. When it comes down to preference however, I always take my Shure Beta 58a and my BG 5.1 vocal condenser if its just me singing through them. The SM 58 always rides along but the other two are just all around better/stronger mics. One of the best things about all Shure Mics is the amazing warranty they have. Even when its out of warranty, no matter what happened, or what condition it is in, you can always send it to shure with a nominal fee (about $35 to $40) and get a brand spanking new one in return. Besides that, this mic also gets props for its ability to take a beating and still sound great. For the price (under $100) and its durability, this is a great mic. The precision and quality of the sound is excellent for a mic in this price range. I have used many different condenser mics including Samsons, Audix (also very nice), and behringer and the only one that can share the stage in my opinion is the Audix. The rest are just wastes of money. Yes, I would definitely keep a few of these around all the time. You never know when you might need one and you can always be sure that it will live up to its reputation.